Monday through Friday. 9:00 AM - 1:00 PM. 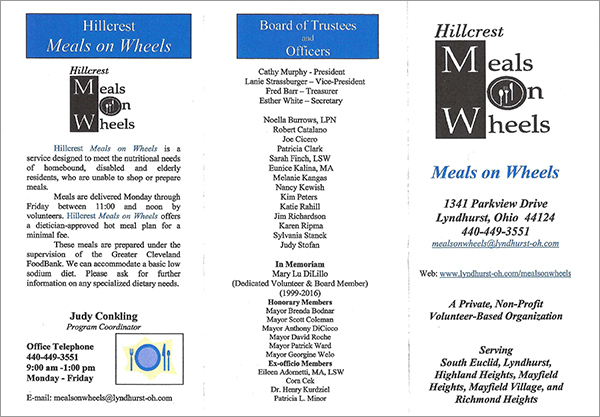 Hillcrest Meals on Wheels is a Private, Non-Profit Volunteer-Based Organization. Hillcrest Meals on Wheels is a service designed to meet the nutritional needs of homebound, disabled and elderly residents, who are unable to shop or prepare meals. Meals are delivered Monday through Friday between 11:00 and 12:00 Noon by volunteers. Hillcrest Meals on Wheels offers ☛ a choice of ☚ a hot meal plan ☛ with an option of two different supplementary meal plans for a minimal fee ☚ . These meals are prepared under the supervision of the Greater Cleveland FoodBank. We can accommodate a basic low sodium diet. Please ask for further information on any specialized dietary needs. Adopt-A-Route was created for Hillcrest area corporations, churches, synagogues, and civic organizations because of an expressed interest in serving their communities. As the population of clients needing our service increases, our need for volunteers continues to grow. Help us keep this vital community service working in your neighborhood and become an Adopt-A-Route partner. We ask that your group commits to two people one day a week, for approximately one hour, to deliver meals to our clients in the Hillcrest area. Provides your organization an opportunity to serve your community. Gives your organization visibility in the community. Establishes a year-round spirit of giving for those who lend a hand to help deliver meals. Gives members a sense of pride for their organization's commitment to community service projects. Established in 1983, Hillcrest Meals on Wheels currently delivers more than 22,000 meals a year in the Hillcrest Communities. Volunteers take a special interest in our clients' welfare. They say delivering meals requires so little time and gives so much comfort to those who depend on this service. "As a volunteer, I find it very rewarding to see the impact our service has on our clients. As a Board Member, I see how important and special our volunteers are." - Esther White, Board Member and Volunteer since 1988. "My Meals on Wheels route gives me a reason to get going on Monday mornings; and this is my chance to give back to the community." "Volunteering here 5 mornings a week helps keep me active and my mind sharp."